A fun thing we can do with molecular models is to create art. In Molecule World™, the residue coloring option applies a different color to each amino acid and nucleotide. When we're characterizing a protein and trying to understand its function, the residue coloring option helps us identify repetitive or unusual amino acid sequences, but we can also use this coloring option to have fun. The video at the end shows all the steps put together. 1. 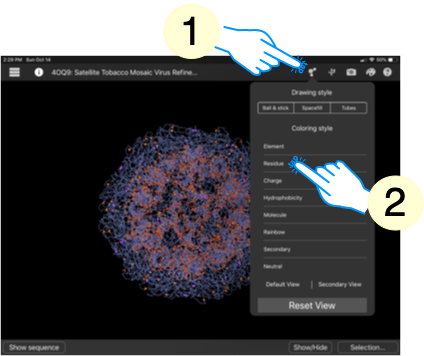 Find and download a spherical protein structure. To make pumpkin-like molecular models, we begin by downloading a sphere-shaped protein model. I used the capsid from Satellite Tobacco Mosaic Virus in my video, but you could also use other viruses or nanocage particles. The PDB ID for this structure is 4OQ9. 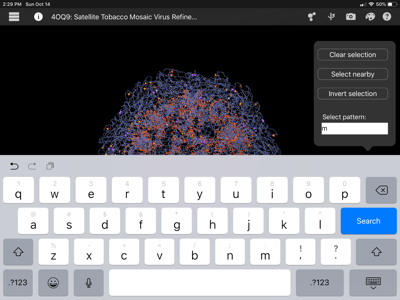 To download it and view it in Molecule World, I open Molecule World on my iPad, touch My Structures, touch the +, type 4OQ9 into the search area and search. 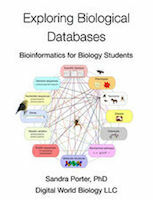 If I have an internet connection, we'll be able to find the structure in the NCBI database, select it, and download it. 2. 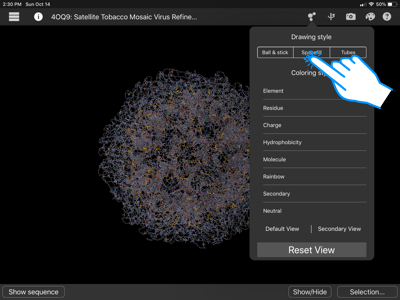 Touch the molecule icon to see different options for drawing and coloring residues. Choose the Residue coloring style. It's also a good idea at this point, to touch the pallet icon to see how each residue will be colored. 3. Touch the Selection button. A. Enter an M and search. This selects all the methionines. B. Enter P and search to select all the prolines. C. Enter W and search to select all the tryptophans. 4. 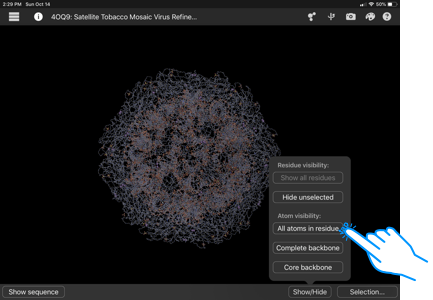 Touch the Show/Hide button and choose "All atoms in residue" to show the entire amino acid. 5. Touch the molecule icon and change the drawing style to spacefill. All the orangish-colored amino acids stand out and there's your pumpkin!